It is a fact of the modern world that high technology requires constant refinement and unending improvement — and that is even truer for those who would be leaders. Dark Power Pro power supplies are renowned as the world’s quietest and most efficient high-performance PSUs. 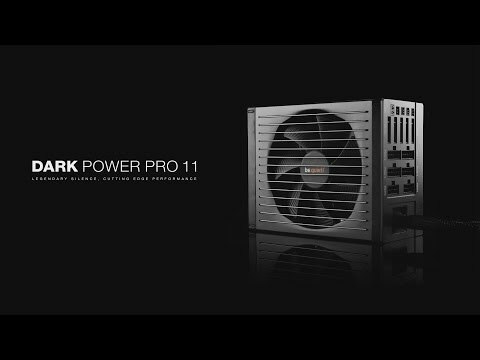 The Dark Power Pro 11 1200W model takes that a step further with a power conversion topology that delivers 80PLUS® Platinum performance, add to that an unparalleled array of enhancements that augment this unit’s compatibility, convenience of use, reliability, and safety, and the result is the most technologically-advanced power supply be quiet! has ever built. • Saving power means saving money, but it also means less waste heat, less cooling required, and overall quieter operation. • Standby drain less than 0.10Watts. • Fulfills the ErP 2014 guidelines. • Zero Load design supports Intel’s Deep Power Down C6 and C7 modes. - Advanced fluid-dynamic bearing with copper core provides for greatly reduced operating .noise and super-long life. - 6-pole fan motor provides smooth operation even at very low speeds. - High quality IC motor controller reduces electrical noise. • SilentWings® 3 fan is decoupled from the PSU body with special rubberized ring mount, reducing transmission of vibration and noise. • Dual-layer PSU housing with rubberized sleeve isolates your chassis from PSU noise and vibration, further enhancing silence. • Optimized PSU airflow generates superior cooling at lower fan speeds, reducing turbulence and allowing even quieter operation. • Variable fan speed is optimally governed to strike the best balance between proper cooling and deep quietness. • Up to four case fans can be connected to, and regulated by the PSU, thus reducing overall system noise even further. • Advanced full bridge, LLC, Synchronous Rectifier (SR) and DC-to-DC power conversion circuitry design supports unmatched signal stability and unbeatable power efficiency. • Overclocking key allows you to choose between multi-rail operation with four independent 12V-rails and high-performance single-rail operation. • Premiere-quality Japanese capacitors rated to 105°C for maximum reliability and operating life. • Increased output of 12V capacitors to minimize feedback sounds of graphics cards. • Top protection for components against over-currents, over- and under-voltages, short circuits, overheating, overloads and voltage surges on input side. • Long service life up to 150,000 hours. • Full performance during 24/7 operation. • Supports the latest Intel® and AMD™ processors. • Compatible with ATX12V 2.4 and EPS12V 2.92 standards. • Professional modular cable management system with removable cable bundles simplifies component installation, reduces annoying clutter, increases airflow and allows for improved cooling. • Cable management with 2x P8 connector for better voltage stability for the CPU. • System supports up to 33 connectors for massive system builds. • Connectors are compatible with older components as well as those still on the drawing board. • Sleeved cable lengths up to 120cm are perfect for large PC cases and allow for improved cooling in any size case. • Individual P4 and P8 plugs support all common mainboard types. • Nine PCIe connectors for powerful multi-GPU configurations (NVIDIA SLI and AMD CrossFireX) up to Quad-GPU. • Clearly labelled plugs and clever accessories promote simple installation. • Advanced, high-resolution gaming and multimedia systems. • Multi-GPU workstations for 3D graphics, photo editing, video editing. • Any application that requires high power with superior quietness. Features • 80PLUS® Platinum certification and up to 94% power conversion efficiency. • Virtually inaudible operation thanks to a broad array of optimizations, including the use of a be quiet! SilentWings® 3 135mm fan. • SilentWings® 3 fan features an advanced fan frame, an airflow-optimized fan blade, fluid-dynamic bearing with copper core and a high-quality 6-pole motor for less vibration. • The funnel-shaped fan opening of the PSU case is significant big and allows high airflow intake. • 1200 Watts of continuous power provide intensive power reserves for demanding computing applications. • Overclocking key allows switchover between quadruple independent 12V-rail mode and high-performance single-rail operation. • NVIDIA SLI Ready and AMD CrossFireX certifications allow you to build powerful Multi-GPU systems with confidence. • Cable management with extra-long cable reach simplifies component installation and reduces annoying clutter, increasing airflow and improving cooling in even the largest PC cases.